Don’t Forget the Just Born Candy for Easter! Who doesn’t love jelly beans? Just Born jelly beans are a must have for filling eggs or candy dishes! Between fruit and spiced flavors, these colorful jelly beans are ready to enjoy. Marshmallow covered in bright sugar is what makes a Peep chick or bunny an Easter treat. Choose from bunnies, chicks, or eggs in one of many vibrant colors to add a finishing touch to any basket. There are even specialty flavors like blue raspberry or party cake flavors to spice things up! 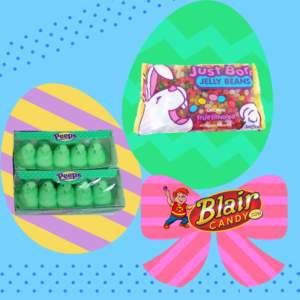 Whether you’re looking for Just Born candy classics or other fun Easter candies, be sure to stop by BlairCandy.com today. You’ll be able to stock up on all of the Easter favorites to enjoy the holiday in no time! Classic Reese’s cup + Reese’s Pieces = mega candy snack. These Reese’s that are stuffed with Reese’s Pieces make one packed peanut butter cup! Each mega cup has little Reese’s pieces inside for a sweet surprise. Take your favorite candy on the go with this snack mix! Every pack is individually wrapped for a sweet, crunchy, and salty snack that’s ready when you are. Have you ever had Reese’s candy in your ice cream? Recreate this awesome concoction at home with your own Reese’s topping. You can also add it to baked goods for a delicious twist. 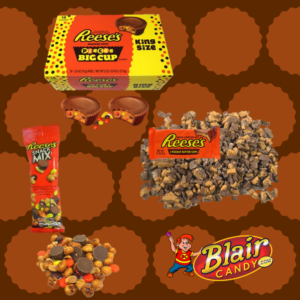 Make sure your favorite Reese’s fan checks out BlairCandy.com today! They’ll find their favorite Reese’s cups along with all of the new treats they’re sure to love. St. Patrick’s Day is less than a month away! What’s a better way to plan festivities by looking at what candy you’ll have? Here’s a few of the classic St. Patrick’s Day candy options that everyone is sure to love. Whether you’re planning a candy buffet or themed goodie bags, these are sure to fit right in. Green and white lollipops like these are a great addition to any party. Put them in an apothecary jar on a table and you have an instant decoration that your guests can eat and enjoy! Make sure everyone finds gold (even if they can’t find a leprechaun) with this gold nugget bubble gum. It makes a great gift because it’s already wrapped up in a cloth bag! Every St. Patrick’s Day needs gold coins. These make a great table scatter, goodie bag gift, or as something to fill the candy dish. Get started now before St. Patrick’s Day gets here! 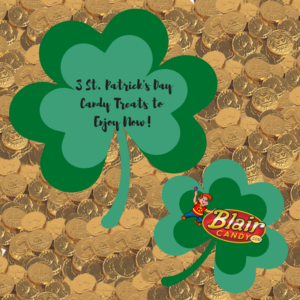 Shop all St. Patrick’s Day candy today at BlairCandy.com. Did You Know these are Gluten Free Candy Bars? Snickers bars are satisfying, full of peanuts and caramel, and are also gluten free! Snag these gluten free candy bars by the bar, bag, or bulk box for easy snacking. Have a love for Reese’s cups? Good thing they’re also gluten free! Grab a box of regular sized or mini cups today to continue that love. Don’t miss out on retro candies! 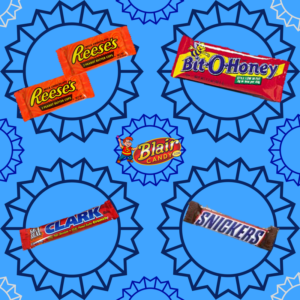 Clark Bars, Bit O Honey, O Henry, and Necco Wafers are all gluten free candy bars that were ahead of their time. Shop these and other gluten free candies at BlairCandy.com today! St. Patrick’s Day is a month away and we’re already thinking of the candy we get to eat! 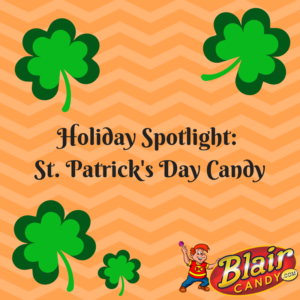 While you have to wait to break out some of the decorations, these are three St. Patrick’s Day candy treats that you can enjoy today! Gold coins are a given on St. Patrick’s Day. Leave some of these out for luck in a candy dish or container. It’s just enough chocolate to satisfy a craving, so they’re perfect to have around. Gummy candies make a great snack, so try these gummy apple rings! They’re festive enough to incorporate into any St. Patrick’s Day decorations once you put them out. Plus, they have a great apple flavor that everyone will love! Want a standard family favorite on hand, but want to change up the color? Our M&M’s bulk bag in green is a perfect way to start celebrating, while keeping something your family already eats on hand. For more St. Patrick’s Day ideas and new candy, check back in on our blog or check out our Twitter accounts! Start Planning those Spring Wedding Favors with Wedding Candy! Spring weddings are right around the corner and you may be stumped on one last detail. Whether it’s a favor for your guest or one more feature for your reception, wedding candy is your answer. 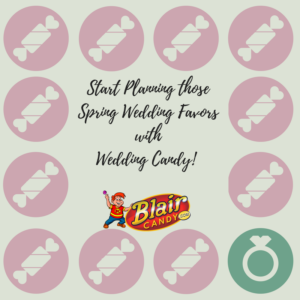 Blair Candy has a variety of candy that is perfect for your wedding. Need wedding favors for your guests that will be memorable? Candy favors never go out of style and are extremely versatile. Choose a fun container, print a label, add your favorite candy, and you’re done! With minimal assembly, this task will be crossed off your list in no time. Choosing décor for your reception can sometimes be challenging. Make something edible and pretty at the same time by using wedding candy. Choose fun vases, colored candy that matches your color palate, and start having some fun! All you have to do is find a combination that works and you’re set. Clean up should be a cinch as your guests will be snacking on your centerpieces! 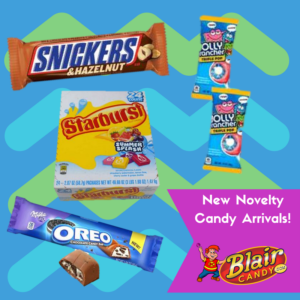 Shop BlairCandy.com today for all of your candy needs! Every St. Patrick’s Day has a parade! 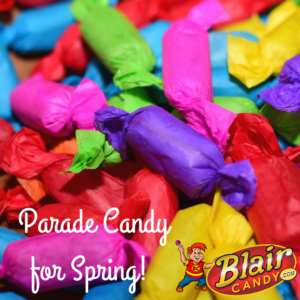 Blair Candy has a major selection of wrapped and unwrapped bulk parade candy that’s ready to go. Just order online soon to make sure it arrives in time! Having a candy buffet at your St. Pat’s get-together? We have all kinds of green bulk candy to go with your décor. From M&M’s, Sixlets, and lollipops, you’ll have something for everyone. Gold coins are a given on this holiday! We have this classic Patrick’s Day candy in a variety of sizes, so no pot of gold will go empty. Check our blog and Twitter accounts every week for more St. Patrick’s Day updates and products! To get started shopping, head over to BlairCandy.com today. Parade Candy for Spring Festivities! How much do you need? Think of how long you’ll be handing out candy and how many people usually attend your event. What’s the weather going to be like? No one likes melted candy! Be sure to pay attention to what kinds of candy you’ll be giving out in regards to parade conditions. When is the parade? Be sure you’ve ordered your candy in time! 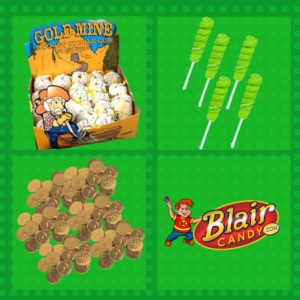 Start shopping on BlairCandy.com today to get all of the parade candy you need for spring functions! Candy in bulk is great around Valentine’s Day for a number of reasons. You can give it to the people you care about, eat it all by yourself, or a combination of both. But the best reason is you can make a ton of DIY goodies out of it! Here are a few last minute things you can do with bulk candy. Make something even sweeter by adding it to your recipe for a much-loved baked good. Try this candy bark recipe or this Teddy Graham’s You can also make cute cupcakes or cookies just by decorating them. Gift a candy treat with a DIY Valentine. You don’t have to get fancy here! Your loved ones will love a homemade card (or a printable one that looks homemade) with their favorite treat. Decorate your home or office with a quick craft! These wreaths made from bulk candy are super fun to have around. Or, go all out on your dinner table with these candy pieces. Either way, you’ll have a festive and unique decoration that no one else will have! Candy in bulk makes it easy to DIY a gift for Valentine’s Day. 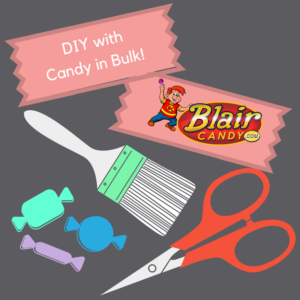 For more ideas, visit our past blogs or go to BlairCandy.com! New Novelty Candy in Stock! Who doesn’t love new candy? Here are a few new novelty candy products for you to try! America’s Favorite Cookie now comes in a candy bar! Inside each chocolate covered bar is a center of Oreo cream and cookie pieces. No milk required, so you can take your favorite cookie anywhere. Love hazelnut? These new Snickers bars add a layer of hazelnut to the milk chocolate, peanuts, caramel, and nougat you’ve come to know and love. Jolly Rancher is known for both their chewy and hard candies. So it’s only natural that they combined them! These lollipops have three layers of crunchy, sour, and chewy candy. Each layer is a different flavor of watermelon, blue raspberry, and green apple. No need to choose which Jolly Rancher candy you’re in the mood for with these lollipops! Missing the fun of summer? These Summer Splash Starbursts should keep you tied over until the season finally arrives. Each pack has strawberry, watermelon, and lemon lime flavors along with two new ones: grape slushy and cherry coolers. Be sure to check out our just arrived page for these and other new novelty candy products. You’re sure to find a new favorite by visiting our candy store!